They say that home is where the heart is. But then if the kitchen is the heart of the home, then this beautiful hub of food drink, chat and togetherness is a heart within a heart. There are a number of personal, practical and emotional reasons why our kitchens mean a lot to us. Let’s face it, many of our fondest childhood memories were made in the kitchens of our childhood homes. Often as we chop, slice, boil, drain, stir and grate we will ruminate on the image of our parents carrying out the same practiced moves and gestures that we now show our children today. We’re doing far more than passing down family recipes, we’re building memories that we and they will treasure forever just as our parents did for us. The kitchen is where we all come together as a family after a hard day at work or school. It’s where we pour ourselves a glass of wine and unwind as we enjoy the therapeutic exercise of cooking. It’s where we bond over a shared love of good food and each other. But while any kitchen can be a place where wonderful memories are made, it doesn’t take much for a kitchen to begin to show signs of wear and tear. Over the years, countertops may get water damaged, chipped, scratched or gouged by wayward knives. Flooring may be forever stained by a spill that just won’t scrub out no matter how hard you try. Drawers and cupboard doors can start to look forlorn as varnish fades or paint chips and peels. All of this can conspire to make our kitchens look old and worn (and not in the deliberate shabby chic kind of way). With spring in the air comes a feeling of energy, motivation and a lust for renewal. As such, many people will be considering a renovation in the kitchen. Not only can this enhance the time we spend in the kitchen it can significantly increase the value of our homes. While most of us have a very specific vision for the kitchen of our dreams firmly ensconced in our minds, we may not always have the budget to facilitate it. Upon getting a few quotes, you may be left with a difficult choice, save the project for a few years until you can do it justice, or find ways to compromise. Either of these is acceptable but going over budget most certainly is not. 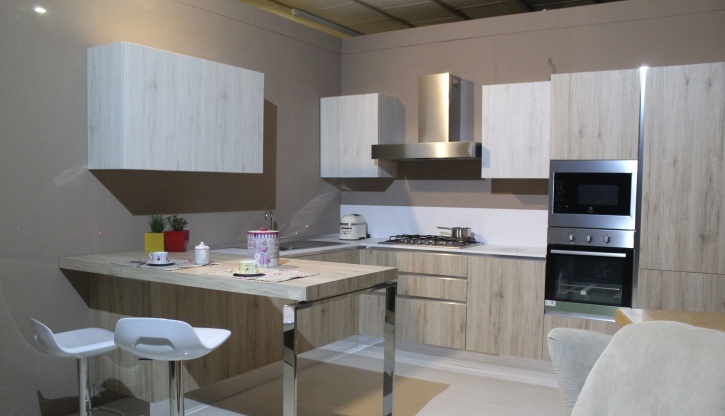 All remodeling projects must be undertaken from the budget upwards but this is especially true of kitchens, where an investment of thousands is often necessitated even for a modest refurb. One of the best ways to budget is to draw up two lists; a “must have” list and a “wish list”. Make sure that your must-have list comes under budget and then you can look at adding some of the confections from your wish list. It’s also worth getting creative with ways you can save money on the project. Instead of replacing cabinets, why not simply repaint or refinish them with some new drawer pulls, handles and fixtures? Instead of removing an entire wall, why not opt for a cutout? There are lots of inventive ways in which you can shave money off the budget of your remodel. As with budget, the sheer logistics dictated by the amount of space you have to work with may necessitate compromise when it comes to building your dream kitchen. Your space will dictate your layout and if you miscalculate it won’t matter how fancy your new smart refrigerator is if you can’t open it without putting a dent in your kitchen island. On the subject of kitchen islands, if you’re among the legions of people for whom a freestanding island is the centerpiece of your dream kitchen, think long and hard before investing in one. Unless you have a lot of room to spare, an island can make the space look small and pokey (even when it isn’t). It can also make the kitchen look less neat and tidy. They look messy, even when they’ve been recently cleaned, appliances look awkward sitting on them and if you have a cat, prepare to wipe cat hair from the surface every time you’re about to use it. Moreover, an island can interrupt the flow of the room and provide a barrier to interaction. If you want to create a social hub for your kitchen and a place to perch when cooking, consider some of these fun alternatives. If your tastes lean towards the modern or futuristic, your dream kitchen may well be a vision in pristine white enamel, brushed steel, and pristine white marble. There’s no denying that all white kitchens look spectacular. They lend a sense of spaciousness to the room, make the most of your light sources and the breezy feel that they bring to the table will be subtly enhanced in the coming spring and summer months. Unfortunately, however, white kitchens have their downside. They’re extremely high maintenance and very unforgiving of even small stains, marks, smudges and streaks. As design trends lean towards richer and more vivid colors like blues, reds, greens and rich plums there’s never been a better time to lean away from the all-white kitchen without compromising on the clean and modern feel you aim to achieve. We get so wrapped up in how our kitchen will look to visitors that we can quickly forget that kitchens are, first and foremost, for cooking in. In order to cook well, we need a lot of access to light, whether it’s to read the instructions in a recipe book, to read the temperature dial on the stove or to chop the carrots without taking the tips of our fingers off. Inadequate lighting in the kitchen will not only lead to eye strain and cost you the fine edge you need for cooking dishes to perfection, it can also cheapen the look of your kitchen. Insufficient lighting can make a bright and cheerful kitchen look dowdy and dirty. It can make shadows that look like smudges and obscure the little touches and flourishes that make your kitchen special. Even if you’re unable to add lighting to the room’s electrical infrastructure you can add simple extras like under-cabinet lighting to make the room a little brighter and make the aesthetic of your kitchen pop. That said, surfaces are really, really important too! Although lighting can play a huge part in making or breaking the aesthetic of your kitchen, your countertops are probably the single most important factor in defining your kitchen’s aesthetic. As important as the look and feel of your kitchen may be, it’s even more important to remember that the kitchen is probably the most functional space in the home. Your countertops need to not only compliment the aesthetic of your kitchen but stand up to the various tests of its endurance that come with a family kitchen. Wooden butcher block countertops were all the rage a little while ago but if you’re considering these it’s worth noting that wooden countertops may well look amazing at point of purchase but they do not age well even when properly treated. My recommendation is that you get on over to World Stone Group and pick out something in natural stone. Not only do natural stone surfaces elevate the look of any kitchen, they’re extremely hard wearing. If you’re looking for versatility and durability the choice will likely come down to wither granite or quartz. While there are inherent advantages and disadvantages to each, quartz comes out with the slight upper hand. They’re fairly comparable in terms of price and while granite offers greater heat resistance it’s more prone to chips and marks and is slightly higher maintenance. Quartz, on the other hand, is a little more flexible than natural stone virtually indestructible so long as you remember not to burden it with your hot cooking pots, which can damage the polymer resin with which the stone is treated. Remember to build redundancies when it comes to storage solutions since whatever storage you plan for, it inevitably won’t be enough. Fortunately, the kitchen industry has a wide range of useful storage solutions. As tempting as it may be to use open shelving, while it may look great in photos, it’s rarely an effective storage solution for a busy kitchen. Those carefully planned displays tend not to look so neat and tidy after a few weeks and the combination of dust and grease can coat everything on them in a thin layer of grime. Keep these in mind and you’ll have your dream kitchen on time, on budget and on point!